The most heartbreaking story of the weekend so far came on Friday afternoon as the #16 Busch North team of Kip Stockwell loaded up early to head home from Irwindale. Later in the evening, it turned into a heartening story…we’ll get to that chapter shortly. Stockwell is one of the most bare-bones racers of the entire Northeast. He and his father have scraped and scrapped in the Busch North Series for years. This season, they’ve had moderate success and finished 15th in points. They had earned an invitation once before, but had to turn it down because of a limited budget. But this year, they were determined to make the trip and excited about going to the All-Star Showdown. Pontiac to bring out West. The team managed to get it together and loaded onto Dale Shaw’s hauler to make the trip while Stockwell and his father piled their tools and spare parts into a pick-up truck and made the cross-country trip from the mountains of Vermont. They even stopped at the Grand Canyon along the way. In a perfect world, Stockwell would have came out to Irwindale and won the race. In reality, he had a mechanical problem in practice and headed home early instead. Stockwell was pretty dejected on Friday afternoon and didn’t feel much like chatting. 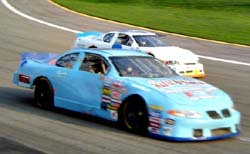 He did tell Speed51.com that he wasn’t going to chase down another team’s back-up car just to start the race. Stockwell and his volunteer crew started to load up their pick-up truck for the long trip home, but they did in prematurely. Thanks to the generosity of another team, Stockwell will be back on track after all. Shaw’s team owner Mark Willoughby and loaned him a spare engine as long as Shaw made it through Friday night’s qualifying races without a problem. Shaw emerged from the event with his motor intact and Stockwell will be installing it into his #16 before Saturday’s feature. On his way out to Irwindale, Southeast Series driver Dusty Williams stopped at Phoenix International Raceway to take part in the Southwest Series finale. Things didn’t go exactly according to plan – or back-up plan even. Williams had a bad first lap and last lap at Phoenix. In between wasn’t too bad though. It was announced at Irwindale that Portenga’s replacement at Bill McAnally Racing will be NASCAR Dodge Weekly Series national champion Peyton Sellers. The NASCAR Nextel Cup team of Richard Childress Racing has arranged the deal as part of their driver development program. The Williams team repaired their damage in time to practice on Friday at Irwindale. Steve Portenga set the fastest time in Friday’s final practice for the Grand National division. The NASCAR West Series driver put his #16 Chevrolet on top of the speed chart in what will be his final event driving the car. We knew that we had a good car all weekend,” said Portenga. 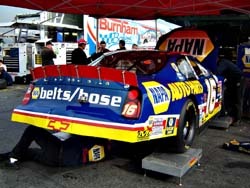 “The NAPA Auto Parts car has been good. Yesterday, we spent all day on old tires, we weren’t worried about anything. We were practicing yesterday for what the car would be like at the end of the race and today we practiced with what the car is capable of doing. It’s just a little bit of strategy on our parts to get them scratching their heads and the car is a lot faster than it’s even shown. It doesn’t look like this will be Portenga’s final Showdown though. He expects to be back in the West Series for 2006.
rookie teams from the Southeast, so we’re proud and we’re going to have a real good time. Stivers credits his crew with making it all possible. Now, after the garage closes on Friday night, it will be time to sleep. Eddie Stivers was another SES driver doing both events, like Williams and Norris, his race didn’t go as planned. Then again, his whole week didn’t go as planned. 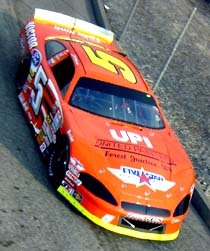 “We got into California where we had leased a car [for Irwindale],” said Stivers. “Then we found it that it wasn’t going to be ready through no fault of the people who we leased it from. We had to go all the way to Stockton, California [from Phoenix on Wednesday night] to bring it back. We had a 740-mile round trip. If you add that to the jet lag and the time change, we had a long day yesterday. “We didn’t run as good as we wanted to last night, so that kind of hurt our feelings,” said Norris. “We had a real good car, we had a fast car and two or three times this year, we ended up with a flat tire and a few laps down to make up. It was kind of like Nashville all over again. We came back up to 15th. I just can’t get lady luck on my side. Now, he’s working on part two of his plan and winning at Irwindale would make Phoenix a distant memory. 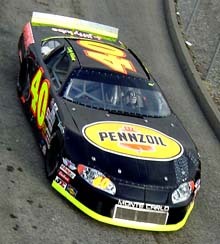 The #40 of Dusty Williams. The #16 team prepares Steve Portenga's ride.